Relationships are the key to future success in the real estate business. Relationships pay dividends, build referral networks and can last a lifetime. Leads, however, have an expiration date, are not personal and are sold to the highest bidder. Relationships act as a net to capture high-quality leads, and as time goes on that net only becomes larger. Growing up in the real estate business, I witnessed this net expand firsthand as I saw agents who invested time and money into relationships with clients reap long-term success. The point I want to make is that agents should invest 80 percent of their time and money into relationships and 20 percent into leads, not the other way around. With so much information on the Internet and 10,000 different ways for consumers to find an agent, the chances of a consumer selecting you are slim to none. Communicating your value proposition is becoming more difficult by the day as millennials, specifically, are looking to hire real estate agents to help them through the transaction and homeownership experience, not the search. Millennials, if not already, will become the most savvy real estate consumer ever, furthermore emphasizing the importance of real estate agents to connect with consumers on a personal level starting long before they make their first home purchase. For example, law and accounting firms sponsor countless startup company events to form relationships early in order to ensure future business. How do I know this example works? It worked on my colleagues and me after we all hired the same law firm. 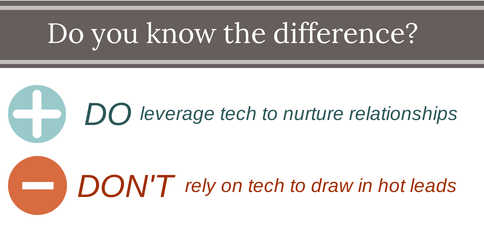 I believe it is important for agents to shift the way they look at technology from “How do I leverage technology to farm more leads?” to “How do I leverage technology to grow my relationships?” Looking at technology this way is much more calculated, as you are investing more in your sphere of influence rather than people you do not know. The concept of leveraging technology to learn more about the individual needs of your networks to better serve them is time and money much better spent than following up with random people. From what I heard at Real Estate Connect last month, more and more young people in tech are buying million-dollar-plus homes in San Francisco. With tech startups proliferating around the country, I am sure this trend is to continue in other major markets — meaning that connecting with young entrepreneurs is a great way to build relationships with potential clients who will probably buy several homes. Talk about a great source of recurring business. As an agent, it is really easy to start sponsoring local startup events with food and drink. This is an inexpensive and effective way to get in front of great potential long-term clients. The modern real estate consumer has mastered the housing search, and I believe the transaction will be the next area this modern consumer tackles. To stay ahead of the curve, understanding the realities and needs of homeownership will allow you to actively help your clients use best practices to protect their largest investment. This helps you stay relevant after closing and stay top of mind with your clients. It is safe to say there is more information online about people than they tend to realize or care about. Use this as an opportunity to learn more about your clients to create a better understanding of how to best serve them. Facebook, LinkedIn and all major social networks leverage your online activity to tailor your online experience. Tools to achieve this can be easily incorporated into your business. It is only a matter of time before this becomes a predominant practice in real estate. Learning to serve your clients’ individual needs better helps ensure long-term success and creates a great reputation for your business. Investing 80 percent of your time and money into relationships is a sound strategy to cut through the noise and become a local expert.